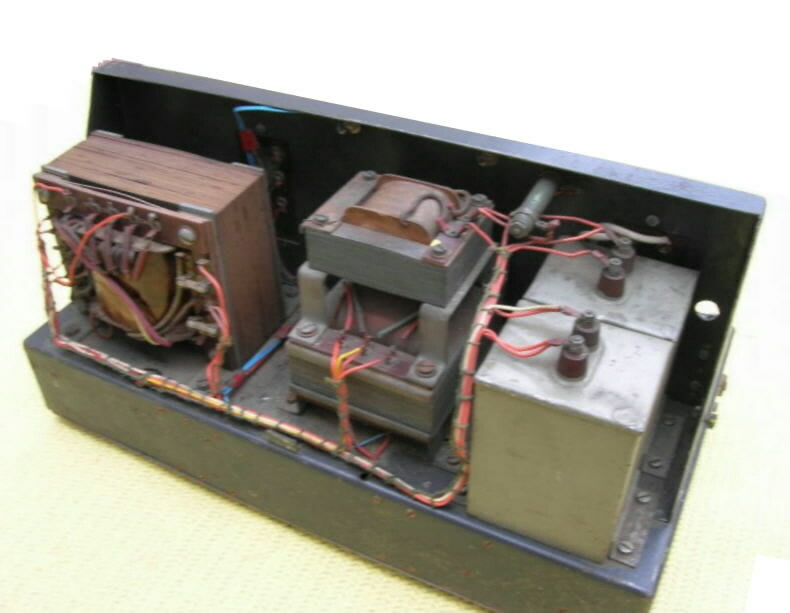 Founded in 1880, Lorenz was a real pioneer in communication technology and realized the first TV transmission in 1920. 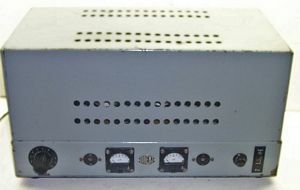 In 1923 they started the production for radio receivers. In 1930 the SEL (Standardelektrizitäts- gesellschaft of the ITT) becomes the major shareholder of the Lorenz company. 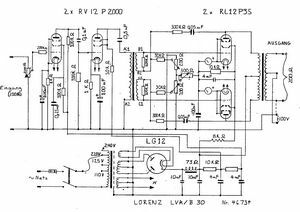 Before WWII Lorenz was one of the few brands having the license to built amplifiers for cinema sound equipment. The 1940s LVA/B 30 is now a real classic. 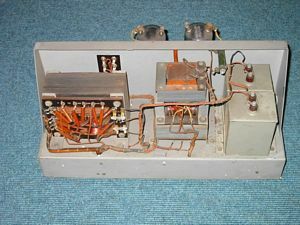 This is one of the precursors of the LVA/B 30 RL12 amp. 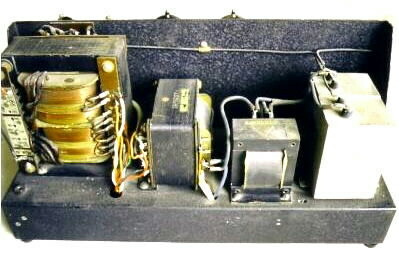 This amp appeared in the 30s and used REN904 drivers and RV218 (I guess) triodes (24w dissipation). 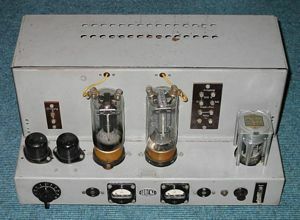 In 1940 Lorenz acquires the Schaub Apparatebau. In 1944 about 24.000 people working for Lorenz only build equipment for military purposes. 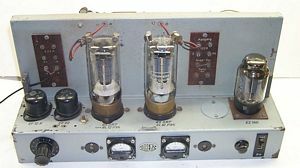 In the same year Telefunken introduces the LG12 rectifier tube for the German Wehrmacht. 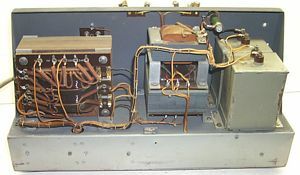 In 1946 Lorenz returns to the production of consumer electronics. 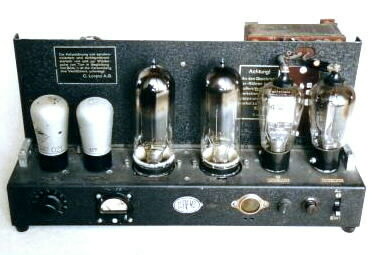 The LVA/B 30 is introduced with a set of "Wehrmacht tubes": RL12P35 output, RV12P2000 drivers and LG12 rectifier tube. 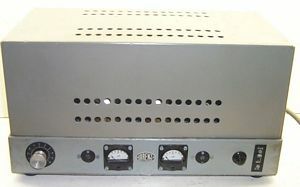 A new feature are the individual meters for the bias control of the output tubes. The choke is now mounted on the top of the output transformer. 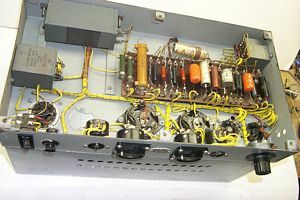 Though electrolytic caps became more and more popular the amp still uses the better paper in oil capacitors in the power supply. Many thanks and greetings to Eric L., Washington State, for the great pictures and the schematic! 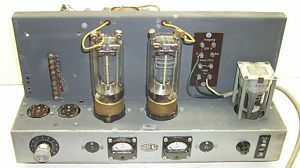 The EF12 tube is not new (introduced in 1938), but according to fact that it was also used in the later version with EZ150, this version seems to be the successor of the above amp. Circuit design and layout and chassis do not really differ. With the later (low noise) EF12k there might have been an improvement concerning hum and noise. The top cover has been cut for better ventilation and optical appearance. 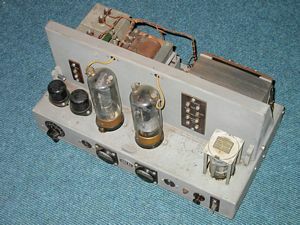 The last version of the LVA/B 30 was equipped with one of the most powerful rectifier tubes of the late 1940s: the EZ150 (introduced in 1948/49). 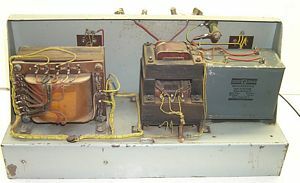 Besides the new rectifier tube there were no other major changes. 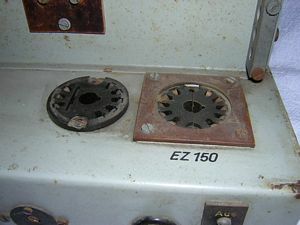 As the availability of the EZ150 was never so good (nowadays still highly sought after), the amp pictured was changed to use a pair of EZ12 rectifier tubes. 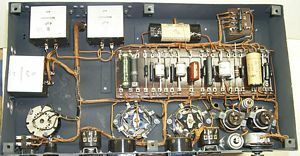 The last version (1950s) of this amp - now having tone controls instead of bias meters - still used the same chassis, but EL34s as output tubes. 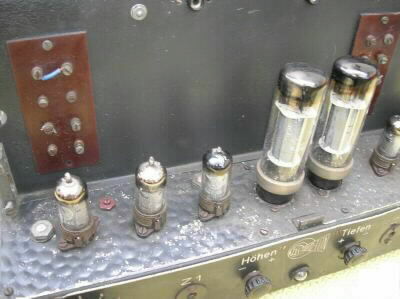 Drivers: 4 EF40 tubes and 1 AZ12 rectifier.